MOSCOW, May 2 (Itar-Tass) - The Russian military transport airplanes Il-76, which were redeployed from central Russia to the Far East on April 30, use the special spray tanks to put out the fires in the Amur Region, the Khabarovsk Territory and the Republic of Buryatia, the press service of the Russian Defence Ministry reported on Thursday. “The Russian Defence Ministry’s aviation has made 22 flights, dropping over 900 tonnes of water, as of 10:00 Moscow time on Thursday. Over 90 fires were extinguished,” the press service said. Eight military transport airplanes Il-76 were redeployed from the airfields in Orenburg, Taganrog and Pskov to the airfields Ukrainka (Amur Region), Belaya (Irkutsk Region), Ulan-Ude and Dzemgi (Komsomolsk-on-Amur). 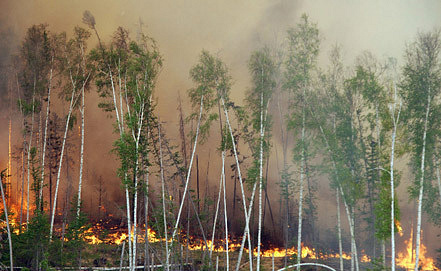 The airplanes are used urgently for the monitoring of the fire situation and the extinguishment of wildfires in the Siberian, Trans-Baikal and Far Eastern regions. All airplanes are equipped with the special spray tanks for the fire extinguishment. The emergency headquarters formed at the situation centre of the Russian Defence Ministry in cooperation with the national centre of management in emergency situations of the Russian Ministry of Emergency Situations and regional authorities are conducting the real time monitoring of the flood and fire situation in the regions and assign servicemen, machinery, army and military transport aviation, which are involved in the cleanup of seasonal natural disasters. The special task forces are formed in Eastern and Central Military Districts. The task force, which the Defence Ministry assigned for the cleanup of seasonal natural disasters, numbers over 38,000 servicemen, over 4,500 units of machinery, over 40 airplanes and helicopters.